A lot of anticipation had arisen around the announcement of A Wrinkle in Time. The first major film with a budget of over $100 million directed by a woman of colour – Ava DuVernay – the film looked set to break boundaries, both financial and cultural. Casting African-American newcomer Storm Reid as the protagonist promised a possible icon for a new generation. The film’s profitable triumph would produce more opportunities for female directors such as DuVernay in the future. In other words, there was a lot riding on A Wrinkle in Time to work. And unfortunately, its representational success is supplementary to a scrappy script and unfocused direction: A Wrinkle in Time is a well-intentioned mess. Its narrative outline doesn’t ease the disappointment, as it would seem to augur a charming yet cerebral detour for the oft-sentimental Mouse House. The aforementioned Reid leads the film as reclusive teenager Meg Murry, who’s suffering from a bad case of melancholia over the disappearance of her father Alexander (Chris Pine) four years prior. What seems like a lost cause reveals itself to be something far more complex: Alexander’s ambitious project – to travel to alternate dimensions – has become a reality, trapping him in the deeper recesses of the universe. With the sudden arrival of a mysterious set of ethereal figures, going by the whimsical monikers of Mrs Which (Oprah Winfrey), Whatsit (Reese Witherspoon) and Who (Mindy Kaling), Meg, along with her brother Charles Wallace (Deric McCabe) and friend Calvin (Levi Miller), is empowered to embark on a journey into the undisclosed realms of time and space, utilising her inherited knowledge of physics to successfully traverse the perilous paths of the fantastical world she discovers. So much potential, nestled amidst the details of this synopsis. A Wrinkle in Time and its director have clear ambitions: to create a character in Meg that the unsung women in the audience can root for, relate to and aspire to match. But it simply fails to achieve its goal for one core reason: its method of storytelling fails to conjure a connection between the viewer and Meg. ‘Witherspoon is charming but Winfrey plays an operatic version of ‘Oprah’ and Kaling is offered a character with one discernible idiosyncrasy and nothing else’: Reese Witherspoon as Mrs Whatsit, Mindy Kaling as Mrs Who and Oprah Winfrey and Mrs Which. © Disney Enterprises, Inc. The foremost culprit? Jennifer Lee and Jeff Stockwell’s flat, disorganised script. Based off of Madeleine L’Engle’s infamously intricate novel of the same name, Lee and Stockwell abandon L’Engle’s scientific explication in favour of blunted sentiment. How does this relate to Meg’s characterisation? Well, in any of the numerous sequences whereby Meg is asked to solve a seemingly impossible task, the film refuses to place us on the same intellectual level as Meg: without any context, we’re left in tow as she leads us from place to place. Instead, within its more emotional beats, A Wrinkle in Time attempts to link us with Meg via the derivatively Disney route of forced romanticism: the answer to everything is love. While this is a perfectly human motivation, the outlandish scenario that inspires it alienates the viewer from any sense of familiarity. Its quirky physics go unexplained, so the chances of relating to Meg’s situation are null and void. What’s more, the film’s emotional spectrum is limited to a clichéd binary that feels outdated post-Inside Out. Reid and her fellow castmates struggle to deliver dialogue that seeks to convince us that love/pride/ambition is all good and anger/jealousy/desire is all evil. As Pete Docter’s brilliant animation proved, these latter emotions are just as essential to the psychic development of the teenager, accentuating their happier times and emboldening them in the process. But DuVernay’s film refuses to operate on this level: its drama builds on an archaic emotional foundation that leaves it feeling predictable, rather than inducing its intended catharsis. Think less Inside Out, more child-friendly Interstellar. ‘Visually, the film is stunning, taking notes from James Cameron’s Avatar and Disney’s Fantasia‘: Reese Witherspoon as Mrs Whatsit. © Disney Enterprises, Inc.
A Wrinkle in Time’s performers can’t temper the disappointing storm either. Starting on a positive note, Storm Reid is a charismatic actress in the making, stealing the camera from towering figures like Winfrey and Witherspoon, a shooting star amidst a constellation of glorified cameos that barely register. Witherspoon is charming but Winfrey plays an operatic version of ‘Oprah’ and Kaling is offered a character with one discernible idiosyncrasy and nothing else. It’s a shame considering how prevalent they have appeared in the film’s marketing: a classic ploy that leaves one feeling underwhelmed with the final product. Visually, the film is stunning, taking notes from James Cameron’s Avatar and Disney’s Fantasia in crafting a splendorous cinematographic nebula that, with ambitious editing and shot choices, always surprises with a fresh perspective: it’s further proof that DuVernay is a daring and brilliant filmmaker in the making. Unfortunately, it’s at the service of a project with a conflicted vision. 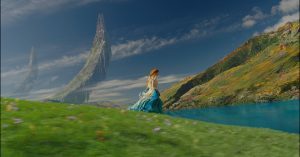 There is an impression that Disney has tethered A Wrinkle in Time, restricting its intellectual and emotional scope in order to appeal to a wider audience. Financially, this makes sense. But from an artistic standpoint, it leaves the film feeling confused and dissatisfying. Its intent is admirable, but on a narrative level, it fails to fulfil its purpose. Great effects cannot make up for a messy movie. So it is with A Wrinkle in Time, as it joins Brad Bird’s Tomorrowland on the growing list of Disney originals that aim high, but burn up on re-entry onto the big screen.